Industrial Shed widely used for designing steel made houses, warehouses and workshops. 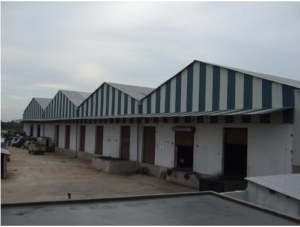 The offered Industrial Shed has been developed by using ‘H’ shaped steel sheet, a number of columns and beams that are attached by steel made anchor bolts, steel made sleeve and purlin with galvanized finishing We take immense pride in introducing ourselves as a Kolkata based eminent manufacturer and exporter of premium quality Industrial Shed. The shape and design of this industrial roofing material remains unchanged even after earthquake. Light in weight, this shed is appreciated for its high tensile strength, utilization of environment friendly raw materials and long working life.We use our own brand Durakolor for sheeting. Our Droit Industrial Sheds are manufactured using Steel Portal frame construction having shield of Pre-painted colored sketch sheets. In addition, we made these sheds as per requirements of client and offer answers that fit to their funds. We have an unbeaten track record for scheming commercial constructions for approximately every application. Our plan advance is interactive and permits being division of the procedure to guarantee client’s full approval. We are one of the principal manufacturers and suppliers of built-up sheds with supreme quality raw material. Industrial sheds are frequently used in fabrication units, warehouses and other industrial areas. We design special fabricated shelters for using as industrial sheds. These are convenient to fit within 3-4 days. Quality, Safety, and strength are put in mind while fabricating these sheds. We offer a comprehensive array of cost-efficient industrial sheds which are widely required in market.